The PCE-IR 1000 series thermometer for high temperatures was designed especially for the metal and steel sectors, particularly for casting, and other industries that deal with high temperatures. 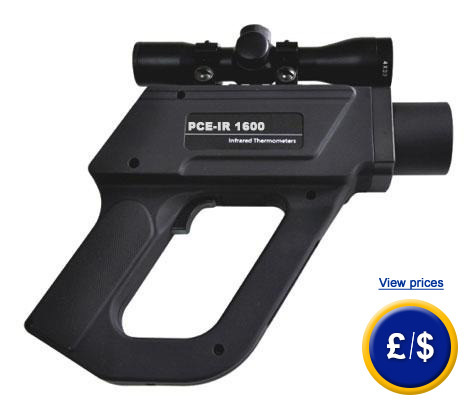 The PCE-IR 1000 series thermometer can quickly and accurately measure temperatures up to 1800°C. The PCE-IR 1000 series thermometer is effective in production, maintenance as well as in research and development. Thanks to its optical resolution of 120:1 and 300:1 the PCE-IR 1000 series thermometer can measure temperature of very small objects. The PCE-IR 1000 series thermometer is suitable to be used for many different applications. Its emissivity can be adjusted according to the surface material being measured. 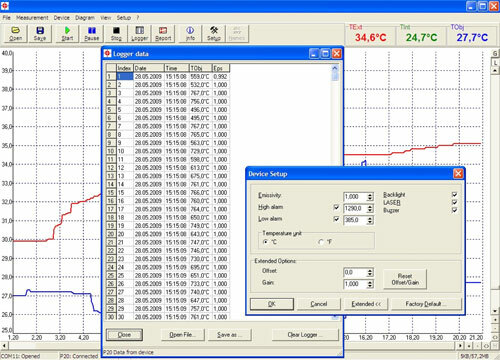 With the help of the internal memory and the software, measured values can be transferred to a PC or portable computer for further analysis. ceramic and power stations, etc. 1 x PCE-IR 1000 series thermometer (one of the three models), 1 x data cable, 1 x software, 1 x rechargeable battery, 1 x battery charger, 1 x carrying case and user's manual.